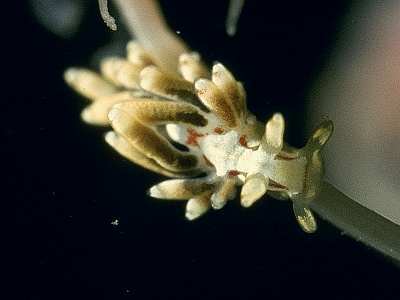 Description: This nudibranch has a complex pattern of red markings on the head and body. The oral tentacles and rhinophores are yellow, with transparent tips and an orange ring just below the tip. The sides of the head and top of the head and heart region have patches of white pigment, and similar patches occur on the centre of the back and sides of the body. A tiny species, typically 6�mm in length when fully mature. Habitat: This species has been found amongst masses of fouling ascidians, small hydroids and Tubularia larynx on floating structures and lines. The precise food requirements are unknown. Distribution: Rare in the British Isles, the only records are from Lough Hyne, Bantry Bay and Galway Bay in SW Ireland. May replace Trinchesia foliata in the Mediterranean Sea, where it is well-known. Similar Species: The markings on the head distinguish this species from other Trinchesia species apart from Trinchesia foliata. Red and white markings in the head/heart region. Yellow line down centre of head. Cerata stubby, with terminal rings of white and orange. Picton, B.E. & Morrow, C.C. (2016). Trinchesia genovae (O'Donoghue, 1926). [In] Encyclopedia of Marine Life of Britain and Ireland.